1. 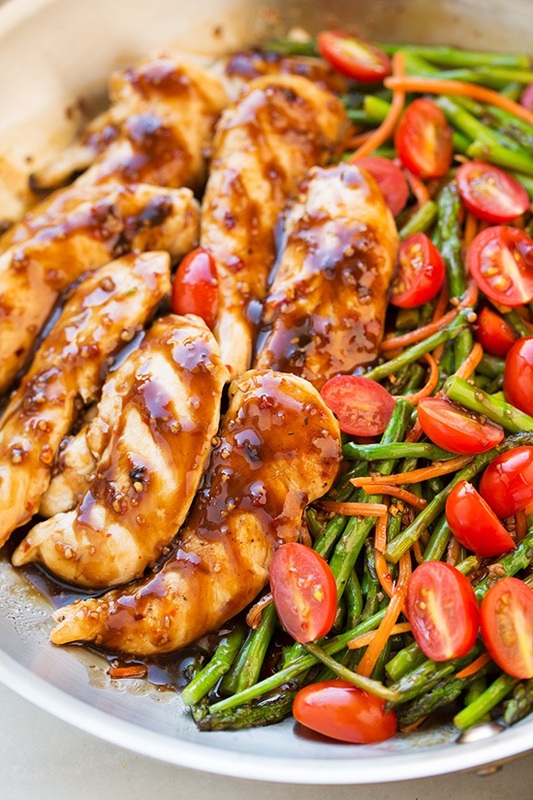 In a mixing bowl whisk together salad dressing, balsamic vinegar, honey and red pepper flakes, set aside. 2. Heat olive oil in a 12-inch skillet over medium-high heat. 3. Season chicken with salt and pepper to taste, then place chicken evenly in skillet. 4. Cook about 6 - 7 minutes, rotating once halfway through cooking, until chicken has cooked through. 5. Meanwhile, chop asparagus and tomatoes. Add half the dressing mixture to skillet and rotate chicken to evenly coat. 6. Transfer chicken to a large plate or a serving platter while leaving sauce in skillet. 7. Add asparagus and carrots to skillet, season with salt and pepper to taste and cook, stirring frequently, until crisp tender, about 4 minutes. Transfer veggies to plate or platter with chicken. 8. Add remaining dressing mixture to skillet and cook, stirring constantly, until thickened, about 1 minute. Add tomatoes to chicken and veggies and drizzle dressing mixture in pan over top (or return chicken and veggies to pan and toss to coat). Yep going to try this!!! Thank you.